Today Sky has announced a whole range of brand new products to see in 2012 that have been introduced by the company to give customers more choice when it comes to what they watch and where they watch it. Sky will be launching a new service that allows customers to watch movies, sports and TV shows over the internet. It’ll give them instant access to a range of Sky content, starting with all kinds of films. The best thing about Sky’s new internet TV offering is that it’ll be available across a range of devices, from connected TVs and PCs to phones and games consoles. According to Sky the internet TV service will be launching at some point in the first half of the year and will be available to anyone in the UK with a broadband connection. Sky plans on extending its broadband network to reach even more UK homes, meaning its service will be available to 88% of the UK by summer. Sky also wants you to feel like you’re cared for when you’re out and about too, so will be offering free WiFi at 10,000 hotspots across the UK in places like Cafe Nero and Pizza Express to anyone that needs it. Like Sky’s broadband offering, its video on-demand service, Sky Anytime+, will be available to many more homes this coming year. BBC iPlayer and ITV Player will also be added to the Anytime+ package later this year and the service will be available to all Sky+HD homes with an internet connection. 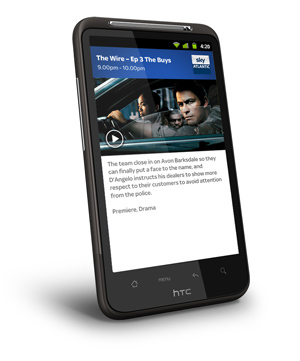 Sky’s TV service for paying customers will be available on the Android market at the end of February. The app will soon allow users to view sports channels, news channels, movie channels and a range of entertainment channels too. We’re still not sure whether a big Sky package is worth it if you’re on a fairly tight budget, but all of these new announcements certainly make the rather steep price tag much more worth while. And we’re obviously also happy to see a few free offerings thrown in there too. We love a good freebie. Are women more obsessed with their phones than men?